In the fall of 2017, Nqobile Mthethwa joined the Teaching for Change staff as a fellow with a focus on the Zinn Education Project. 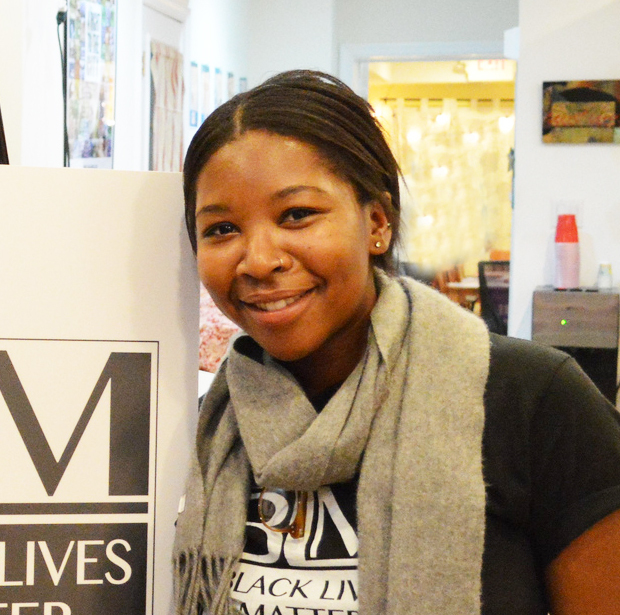 Having just graduated from the University of Virginia, the fellowship was designed to allow Nqobile time to explore work with a social justice organization that aligned with many of her own interests—people’s history, the Student Nonviolent Coordinating Committee, climate justice, research, K-12 education, organizing, and more. The range and depth of her contributions to our work in the D.C. metro area and nationally have been enormous. As Nqobile leaves to do refugee work this spring, we express our heartfelt appreciation for her dedication, wisdom, creativity, and hard work. 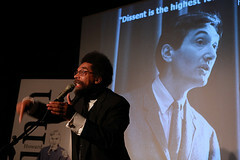 Nqobile’s fellowship coincided with the launch of new initiatives at Teaching for Change and the Zinn Education Project. Therefore, she not only stepped into the daily work, but she also helped shape it. Here is a brief outline of just a few of her many accomplishments and contributions while working here. 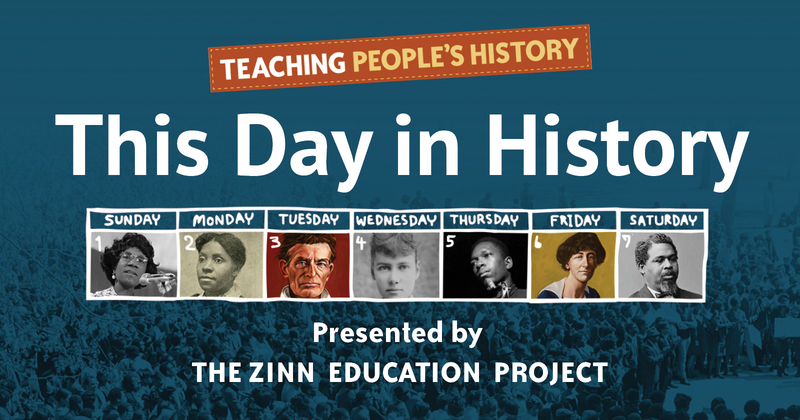 The Zinn Education Project (coordinated by Teaching for Change and Rethinking Schools) created an online database for our popular “this day in history” social media series. Nqobile was the lead staff person making the transition from short Facebook posts to more in-depth stories for the website. This required intensive research, fact-checking, and finding hi-res images. In addition to expanding existing posts, Nqobile researched countless new stories and created thematic collections such as Black Veterans Killed in Fight for Democracy in the United States. Nqobile Mthethwa, Lauren Cooper, and Myla Kabat-Zinn at the Howard Zinn Book Fair, 2017. 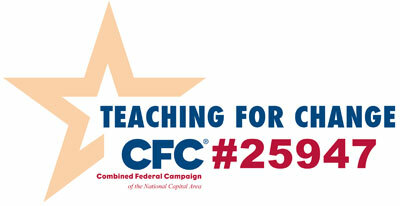 Our Zinn Education Project (with Rethinking Schools) launched a Teach Reconstruction campaign. Nqobile helped design a student mapping project to make Reconstruction visible. Working with Adam Sanchez, Nqobile conducted research and wrote roles for the lesson, When the Impossible Suddenly Became Possible: A Reconstruction Mixer, a role play that explores the connections between different social movements during Reconstruction. To introduce these lessons to classroom teachers, she played a key role in the planning and implementation of a teach-in on Reconstruction at Howard University and a full day teacher workshops in Charlottesville. 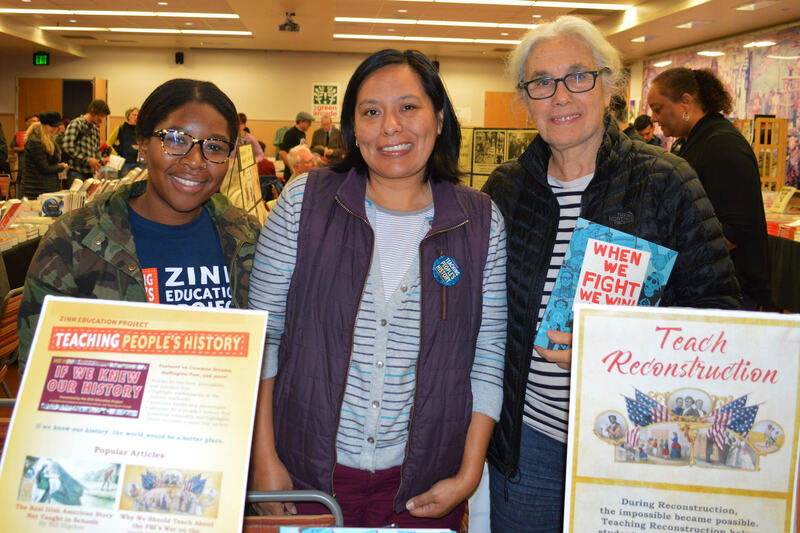 Nqobile represented the Zinn Education Project at key conferences including the National Council for the Social Studies in San Francisco and Chicago and the Howard Zinn Bookfair in San Francisco. 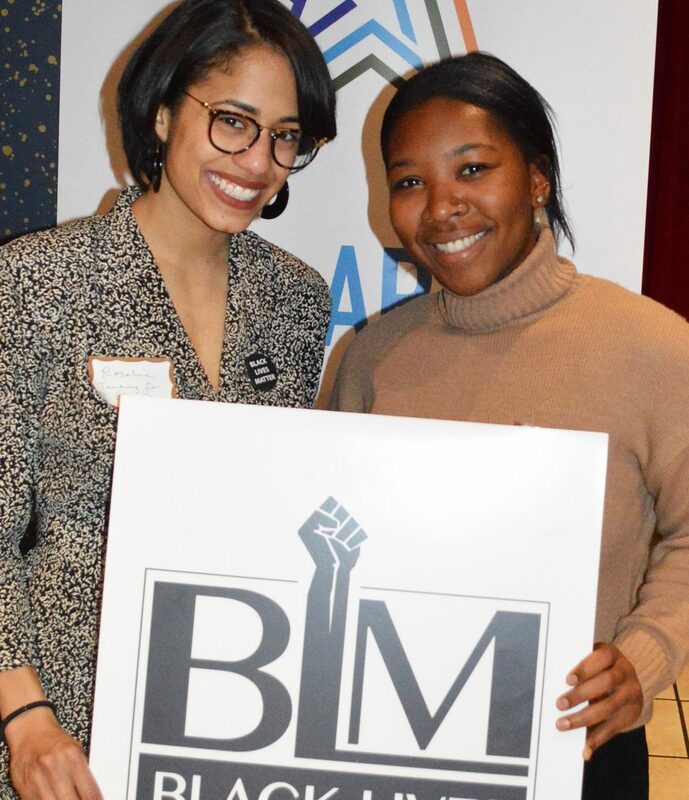 Nqobile worked with Faye Colon in the 2017-2018 school year to engage teachers in more than 100 schools in the D.C. metro area in the first regional Black Lives Matter Week of Action in Schools. That same school year she helped plan public events leading up to and during the week of action, including a session for educators with Dr. Ibram Kendi, author of Stamped from the Beginning, and “Love Poems to Black Women,” an open mic poetry night. In the 2018-2019 school year, Nqobile worked with Rosalie Reyes to expand not only the participation but also the preparation. Close to 400 teachers participated and also benefited from preparatory events such as a Curriculum Fair at Howard University. In addition to the public events, Nqobile visited schools to introduce the Black Lives Matter at School Week of Action at staff meetings. During the week, she visited more than a dozen classrooms to document the lessons with student quotes, a narrative description, and photos. As a result of scheduling and conducting these visits, we now have the most detailed description in the country of the week of action’s impact in classrooms. Meeting at Virginia State University to talk about documenting the history of the VIA. From Left: Creative Coordinator Mykella Palmer, researcher Nqobile Mthethwa, Knox Tull, Dean Elsie Weatherington, and historian Francine Archer. 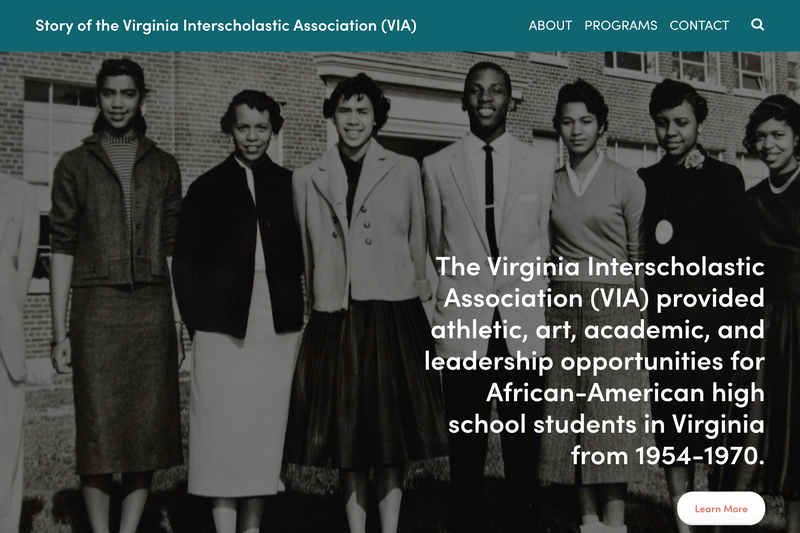 Teaching for Change was invited by Knox Tull to create the Story of the Virginia Interscholastic Association (VIA) website in collaboration with Virginia State University (VSU) and the VIA Heritage Association (VIAHA). The project is designed to preserve the rich heritage and legacy of African-American students and adults who participated in the Virginia Interscholastic Association from 1954-70 and its predecessor organization the Virginia Interscholastic Association League (VIAL). Nqobile joined the initial planning meeting at VSU and made follow up trips to Petersburg by train to scan documents in the archives. The development of this project would not have been possible without Nqobile’s time and expertise. Faye Colon; SNCC veterans Courtland Cox, Frank Smith, and Timothy Jenkins; Deborah Menkart, Nqobile Mthethwa, and unknown. Nqobile helped raise awareness about the Student Nonviolent Coordinating Committee through workshops for teachers in D.C. and visits by veterans to D.C. classrooms. To address the limited visibility of SNCC veterans on Wikipedia, Nqobile prepared and submitted a page for SNCC veteran Timothy Jenkins. After months of back and forth with the Wikipedia reviewers, the page was approved and made live. This not only makes the story of Mr. Jenkins available forever worldwide, it also paves the way for the addition of more Wikipedia pages about SNCC veterans. Nqobile joined the team of reviewers for the annual Children’s Africana Book Award. 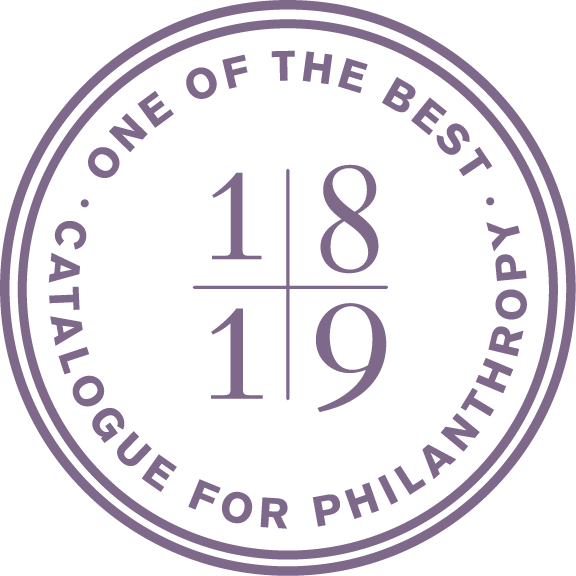 She read at least two dozen children’s and young adult titles in preparation for the 2019 award selection. Nqobile represented Teaching for Change and the Zinn Education Project at book talks, fundraisers, media interviews, and teacher institutes. 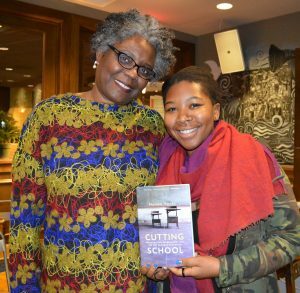 These include a talk by Noliwe Rooks (in photo) about Cutting School: Privatization, Segregation, and the End of Public Education, a summer institute at the National Museum for African American History and Culture (NMAAHC) with Enid Lee, a Data for Black Lives conference at MIT, a discussion of the documentary The Long View at the Center for Popular Democracy, a filmmaker’s visit to Howard University to record footage for a documentary on Reconstruction, a We Act Radio interview about Black Lives Matter at School Week of Action, and much more. Nqobile also helped plan and implement people’s history trivia nights in D.C. and San Francisco. As a researcher for the Institute’s “Digital 64 Project,” she organized and archived data for the OMEKA Web Exhibition on the Civil Rights Act of 1964. She also digitized and categorized over 5,000 documents from a variety of sources. Her research interests include organizational structure of grassroots movements, federal legislation of the Civil Rights era, and documenting untold historical narratives.